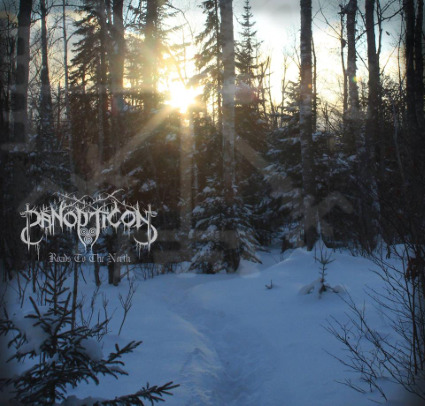 PANOPTICON has never been a typical black metal band. Multi-instrumentalist and vocalist Austin Lunn's heartfelt, vitriolic blend of anarcho-crust, Appalachian folk, and atmospheric black metal is a unique entity, and his impressive recording history is a testament to his devotion. The band's previous effort, Kentucky, was rightly hailed as one of 2012's finest extreme metal albums, and now, with the imminent release ofRoads to the North, 2014 has better watch its back. Lunn’s latest effort and fourth full-length sees him break new ground for the project and explore Scandinavian death metal in all its melodic fury. It’s a dynamic, stirring album, and one that will completely enrapture all who stand in its way. The album features a litany of guest talents and close comrades, including members of Waldgefluster, Celestiial, Blood and Sun, Obsequiae, Altar of Plagues, Vit, Austaras, and Vukari, and was engineered & produced by ever-prolific sound wizard Colin Marston. Lunn himself utilized a wide range of instrumentation to realize his vision, from dobro and banjo to mandolin, Native American flute, and keyboards as well as his customary guitars, bass, drums, and vocals. It’s an overwhelming musical work, and one that stands tall amidst Lunn’s untouchable discography. Roads to the North marks a paradigm shift in Panopticon's sound, but also stands as the first collaborative action between like-minded partners Bindrune Recordings and Nordvis Produktion. The album will be available on deluxe 2XLP and CD; Bindrune will look after North American sales, with Nordvis handling the release in Scandinavia and Europe. A.Lunn | drums, guitar, bass, vocals,, Native American Flute, banjo, mandolin, resonator guitar, dobro, keyboards, samples, recording, art, lyrics and songs. Winterherz | guest vocals on "...In Silence"
Ben Smith | guest Vvcals on "Capricious Miles" and "The Sigh of Summer"
Tanner Anderson | backing vocals on "Chase the Grain"
Dave Condon | guest Vocals on "Chase The Grain"
To get to the heart of the matter; Panopticon’s newest album ‘Roads to the North’ is fantastic. It even beats 2012’s classic ‘Kentucky’, which would seem impossible until you’ve listened to it. ‘Kentucky’ introduced the premise that bluegrass and black metal could coexist harmoniously on a single album, which was certainly a shock the first time I’d listened to it. The question that I had before listening to ‘Roads to the North’ was how much further the idea could be taken. There are certainly albums where a band or artist stumbles on to something special and they ultimately decide to just do that same thing again. That isn’t the case here. The album kicks off with the sort of blasting combined with folk string instrumentation that Nokturnal Mortum has played with since Nechrist, and it works exceedingly well. In fact, all of the folk and bluegrass elements present on ‘Kentucky’ are factored in much more smoothly on this album. You might say the difference, if you’ll excuse the bizarre analogy, mirrors the changes in Luke Skywalker from ‘Empire Strikes Back’ to ‘Return of the Jedi’. In ‘Empire’, Luke was a wild-eyed hero with unlimited potential, but in desperate need of discipline to channel all of that talent. In ‘Jedi’, Luke was supremely confident, more restrained, but not without fits of passion. The same can be said of Austin Lunn’s growth from ‘Kentucky’ into ‘Roads to the North’, both as a song-writer and as a musician. Perhaps a more relevant comparison would be the change in Emperor and in Ihsahn in particular from ‘In the Nightside Eclipse’ to ‘Anthems to the Welkin at Dusk’. The starkest shift in overall direction comes in the form of the inclusion of melodic death metal riffing; not unlike At the Gates circa Terminal Spirit Disease and Grand Grimoire era God Dethroned. It’s a new song-writing ingredient that actually may be a stroke of genius because it flows so well with the melodic black metal and it breaks up all of the open chords and folk elements with something that damn-near requires headbanging. It helps that the “Gothenburg style” has had some time to heal its wounds and catch its wind after scores of bands ran it into the ground ten-plus years ago. As far as other new elements, “The Long Road Part 2: Capricious Miles” has an extended mid-section that swims the same waters as Damnation era Opeth (“Windowpane” and the quieter moments of “Deliverance” to be specific). Here to, the choice to spend several minutes in a softer dynamic, without utilizing the acoustic guitar/banjo/fiddle that makes up a healthy portion of the album’s softer sections gave me the sense that there’s still plenty of territory Lunn is willing to explore and that the best may not be behind us after all. If you’d rather look at Panopticon 2014 in a macro sense; Austin Lunn is a song-writer worthy of adoration. He has found an ultra-unique voice within an ever-broadening black metal landscape. If you take a step back, you could probably make the case that Lunn is right at the top of the list of most talented metal musicians in the United States at this moment. I certainly wouldn’t argue against that. ‘Roads to the North’ is his finest album to date and despite my general distaste for albums longer than 50 minutes, this album warrants its seventy four minute run time. Only time can truly be the judge of things like this, but I see no reason why ‘Roads to the North’ won’t be seen as a classic album as the years go by.